My names is Tiru Sudar. 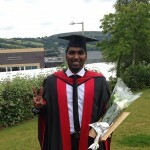 I have just graduated from with a Masters studies in Aircraft Engineering from University of South Wales, UK I first know Ms. Shakeela many years ago when she first helped me and my friend Prakash to study in IT Carlow, Ireland in year 2013. I have completed my Bachelor degree then and I continue to study my postgraduate masters studies. It was Ms. Shakeela who has so much helped me to achieve all this. She has helped me all throughout my application process! She was extremely helpful, she gave me guidance from step to step!! Therefore, I would recommend Easy Study to anyone who is looking for a successful overseas application with a personal guidance!! !